About a week back a reader (Nina) asked me if I had any craft projects on hedgehogs. The answer was no so I decided to come up with something. 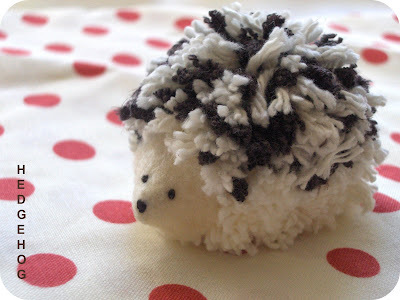 Well after a little thought, I decided to make a pom pom hedgehog. It came out just as planned (and trust me, that's rare). 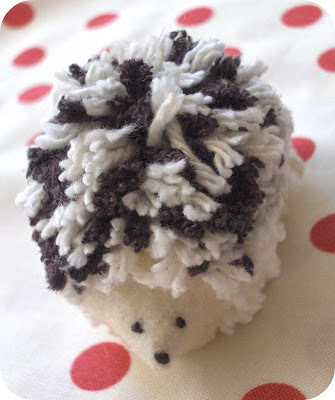 Simple directions below to make a hedgehog pom pom. 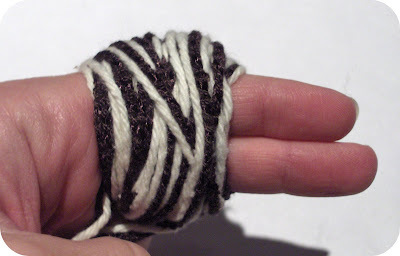 Wind brown and cream yarn around two fingers at the same time. Cut yarn. Now wind just the cream yarn around your fingers slightly overlapping the other yarn. 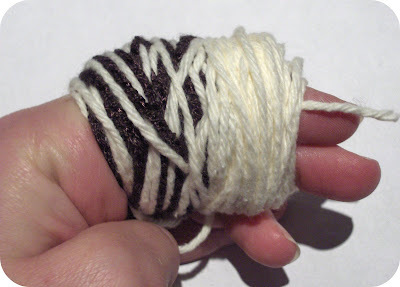 Slide yarn off your fingers. 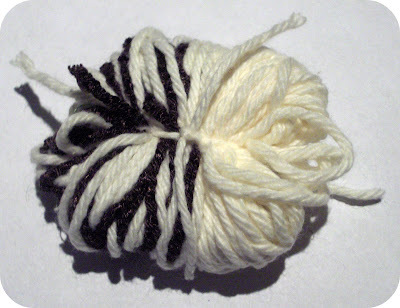 Secure yarn by tying a strand around the center of the ball. If you've never made a pom pom before, there's detailed directions here. Cut the loops as usual. Trim into an oval shape. Left picture - what the top of the pom pom should look like. Right picture - what the bottom of the pom pom should look like. With a small piece of felt, cut and shape into a cone. Sew together. Embroider the nose and eyes on the cone. Glue the cone with fabric glue to the the pom pom. Refer to pictures. Done. My girls LOVE this. Thank you. So cute! I must admit that I'm a bit obsessed with hedgehogs right now. I can't wait to try this. Thanks! So adorable! Thanks for the tutorial. What a cute little guy! I'm going to have to try this later! Yet another cute looking fellow! Going to try this one! Thank you! One of the cutest hedgies ever! OMG, this is just too cute. I have zero time for crafting these days but i am going to fit this in today somewhere. LOVE this. And so easy. So cute, a very good idea to use some left-over yarns and it seems so simple to make it. Cute! Pretty simple for such an adorable end result. How could that cute little face not put a smile on MY face?? How cute!! I have to keep this idea in mind for my class. thanks for sharing. That is *almost* more cuteness than I can stand. You are so amazingly creative. I'll be linking. Hola, es la primera vez que visito tu blog porque estoy interesada en el estilo zakka, es maravillosos todo lo que haces, te visitaré muy seguido, Besos!! so simple to do but so cute! SO adorable! I would have never thought of using pompoms for this. Really amazing!! Kawaii-sou! This is ridiculously cute! I must try it! This is so cute! 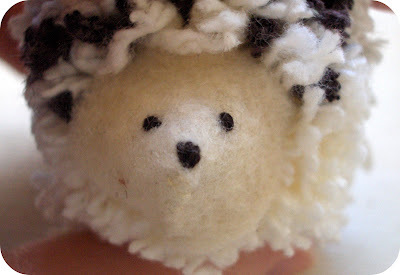 I just learned how to make pom-poms this way so now I must make a hedgehog. Thanks for telling us how to make them! That is a very cute hedgehog. This is just adorable! what a perfect little critter!! thanks so much for sharing the deets!! That is so adorable!!! Can't wait to make one (or a family of them) for my granddaughter! This is too cute! I will be making one this weekend. Precious! Thanks for your wonderful ideas. This is really cute! When my kids were little, we made lots of pom pom animals and little monsters. I was really good at it as when I was young, I made pom poms for my roller skates. LOL! Totally cute! I am going to make one for my 13 yr. old son for his Easter basket. He loves hedgies! He might be a little too old for this, but I think he'll enjoy it!